The mysterious Zuma payload sits atop a SpaceX Falcon 9 rocket at Space Launch Complex 40 at Cape Canaveral Air Force Station in Florida in November 2017. Liftoff is currently scheduled for Jan. 5, 2018. This story was updated on Jan. 4 to give the new planned launch date of Jan. 7. 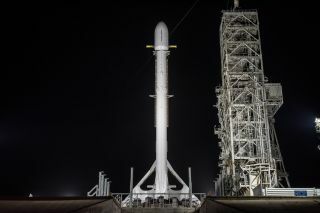 A SpaceX Falcon 9 rocket is scheduled to launch Zuma, a top-secret U.S. government satellite, between 8 p.m. and 10 p.m. EDT Sunday (Jan. 7; 0100 to 0300 GMT Jan. 8) from Space Launch Complex 40 at the Cape Canaveral Air Force Station in Florida. The liftoff was originally planned for mid-November, but SpaceX pushed the launch date back to study data from a recent payload-fairing test performed for another customer. (The payload fairing is the nose cone that protects a spacecraft during liftoff.) SpaceX had been targeting Friday evening (Jan. 5) but on Thursday (Jan. 4) announced an additional two-day delay. Sunday's action will also include a landing attempt by the first stage of the two-stage Falcon 9, which will come back to Earth at Landing Zone 1, a SpaceX facility at Cape Canaveral Air Force Station, which is next door to NASA's Kennedy Space Center. Editor's note: This story was updated Jan. 5 to correct the launch site for SpaceX's Zuma mission. It will launch from Space Launch Complex 40 at the Cape Canaveral Air Force Station in Florida, not NASA's Kennedy Space Center.